By now I was sleeping better and into the routine of the Way of Saint James – early bed and an early rise. My feet had developed some blisters and treatment had made it possible to continue walking. At times a bit uncomfortable but I knew that the skin would get harder and less blisters would result in the days ahead. It was important to keep the feet washed and clean. I used an antiseptic talc powder each morning to ensure the feet stayed clean and dry. Other walkers suggested a cream that prevented blisters and I took a mental note of its name. I explored the abbey after breakfast. There were small staircases and chapels. There were large libraries and reading rooms. It had a fascinating atmosphere and I thought of the many pilgrims who had slept there over the last several hundred years. The light was crisp, fresh and warm and welcomed the day. The abbey grounds were interesting with many areas I had not seen the previous evening. Leaving the village I followed a path down to another narrow Roman bridge. 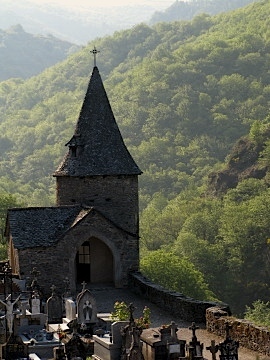 After that it was not so amusing as a long steep climb followed passing the small Chapel of Saint-Foy on the way. 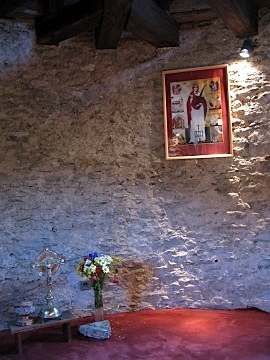 Traditionally pilgrims would ring the bell of the chapel on passing. The country opened up at the top revealing rolling farmland. I was walking on my own as the others had left while I had been taking photographs. I knew we would all meet up again that night. The routine of the Way included discussions on where everyone was heading the next day. At lunch time I stopped by a barn in a small hamlet and heated some soup on the camp stove. There were a few others there including Deirdré from Toronto who I had met on the Way a few days before. The Way continued along a long high ridge before descending into Decazeville, a former mining and industrial centre. As I had almost reached the town, and deep in thought, I stood on something soft. I jumped backwards when I saw it was a snake. I had stood on its head so either it was dead or I had killed it. I concluded that it would have moved away when it heard me approach so it had probably been run over on the small road. A car stopped and a kid looked out in amazement while chattering with his mother. After another steep climb out of Decazeville through the comfortable outskirts of the town came the village of Saint Roch. There was a gite in the village that sold delicious fresh apple juice. Refreshed I continued down to the Lot River, over the bridge and into the village of Livinhac le Haut. I met Christophe as I arrived and we had a beer in the late afternoon sun before getting provisions for dinner at the gite d’etape communal (basic but clean with a tranquil garden).